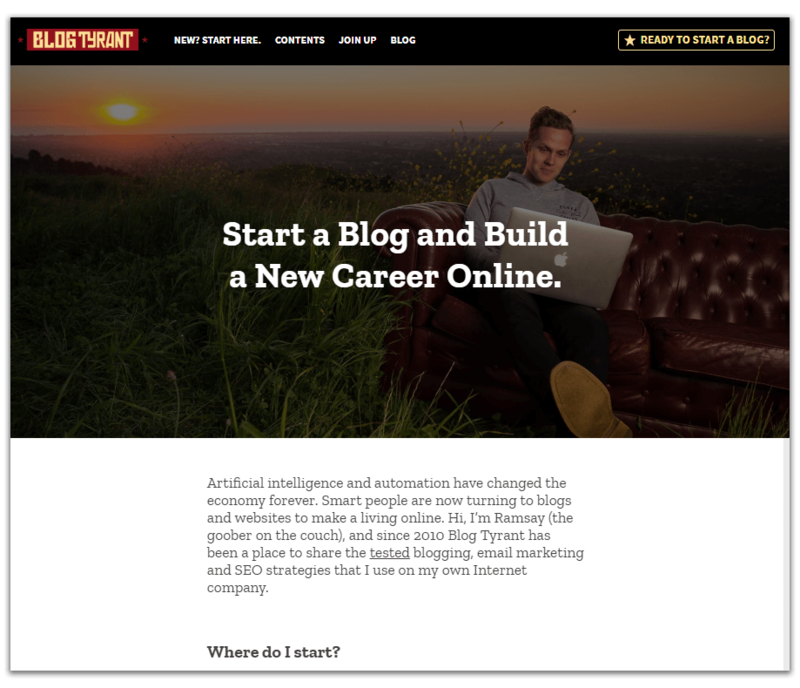 Do you want to know how to write an awesome About Us Page for your blog or website? Are you looking for About page templates or examples you can emulate? Who needs an About page generator if you can get creative and design a great about me page yourself? When someone lands on your blog or website and they don’t know about you or your business, the first page they’ll look for is your About us page. So start by making your About page easily accessible from your homepage (or any other web pages for that matter). An About Page is a page on a site where your visitors or readers can learn more about you and your business and what you have to offer. Often, this web page tells the story of the site creator’s journey from the beginning to finally achieving success (or vice versa). While it’s okay to talk about your story, for a lot of bloggers, they got carried away and they think their About page is just about them. Why Is It Important to Have a Good About Us Page? Should You Include Your Contact Information? Your About page is going to be one of the most visited pages on your blog or site. It can determine whether the visitor is going to stick around and come back or leave your blog. It’s a chance for you to build a rapport that will hopefully turn your casual visitors into avid followers or customers. It’s a point of contact for starting a relationship with your future followers and prospective customers. 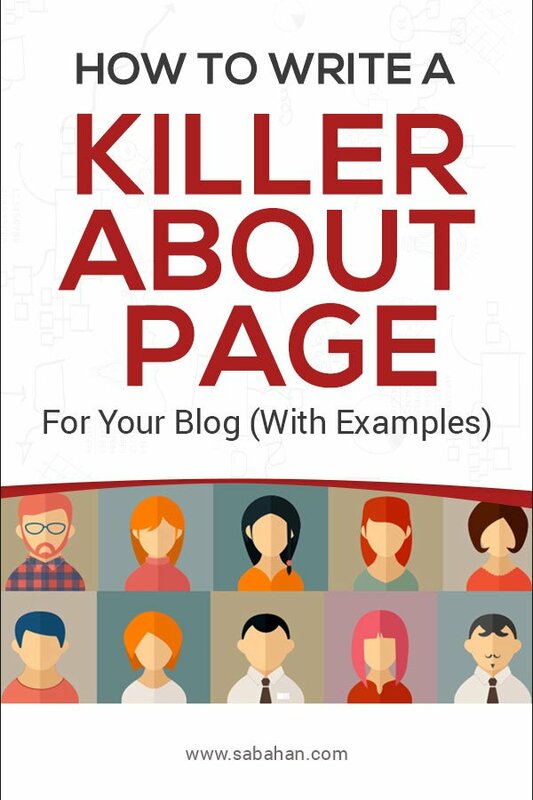 If you are a blogger and have been putting off making your own About page, you are not alone. The good news is you don’t have to make it more complicated than it is. Your About page can be simple, straightforward and conveys just a few key things. Best of all you can do it in under 500 words. However, there’s need to be a balance in selling yourself and driving your visitors away with a self-focused approach. Also, it’s not meant to sell your products or services. In fact, using the hard sell could actually drive them away. Download the printable graphic below that will show you how to create a powerful About page for your blog. For a start, call the page “About”, “About Me” or “About Us” and not “Get to Know Us Better” or “Start Here”. People don’t want to think when they are looking for something. They don’t want to look at your “Our History” link and wonder if that’s where they find out about who you are, what you do, and why they should read your blog. Near the end of this article, you can also find a few About page examples that you can emulate. Use them as templates in coming up with your own perfect About page. So how do you actually start writing an about page that showcases the best of you and what you have to offer? Start by introducing yourself with your name to give immediate sense of trust and familiarity to help the reader know you. How you create the introduction is up to you. What’s important is you let your readers know how you can help them. Good relationships are an important part of any person’s life. Imagine you just met someone, you may only want to get to know the person better if you feel a connection with them. This can be achieved by establishing interest and opening up to the person by telling a story in your About page. So the first thing you need to do is connect with your readers or visitors by creating a story. The story can be about you or about your business. It’s important to understand who you are talking to. So your story should begin by understanding the audience it’s intended for. If you don’t know who you’re talking to how can you tell them what they want and need to hear? Explain how you got to where you are today. Make people see how you know what you know. If you can create amazing stories and connect with the readers, then they’ll be engaged and will most likely come back and be your loyal readers/customers. Loyal visitors can help promote your business via word-of-mouth. For example, if you have had a good experience with a particular shopping website, you’ll more likely recommend them to your friends and family. The next thing you need to do is not just write about you and your business, but you need to you need to talk about how you’re going to help the visitor who’s coming to your blog. Unless you are creating a personal blog and has no plan to make money from it, always put other people before yourself. Be specific, add links to products and service that can benefit them. Adjectives – beautiful, best, big, important, free, success, valuable, useful etc. Emotional words – amazing, faith, happy, hero, surprising, miracle, courage etc. When you do this, you’re more likely to connect with people versus just using text that’s boring. Add some humour and personal flair but try to maintain some level of professionalism. Your visitors want to connect with real people. Also, write like you speak. Use “you” and “I” in your copy to make it more personal. Should you write your About page in the first or third person? I think it’s a matter of preference. Personally, I think writing in the first person sounds like I’m speaking directly to you. No one wants to visit your About page only to be confronted with a large block of uninterrupted text. Use headlines to make it easier for readers to scan and quickly find what they’re looking for. When readers scan your page, they will often read each headline to get an idea about what you have to offer. So use clear and attention-grabbing headlines. Even if they don’t read everything, at least they check the sections that interest them. If you are brand new to blogging, try to create a few guides or posts that you think are useful for your readers and include them in your About page. It’s also okay not to do this until you have enough content to share. As you start creating more posts, you can include the popular posts or any affiliate-type posts that you want to drive traffic to. These posts should showcase your expertise or be the most helpful for your visitors. It’s also your chance to drive traffic to your income-generating posts. Click the button below to get the recipe for a perfect About page. As I mentioned earlier, you should use storytelling to pull readers in and engage them in your journey. But if you are going to tell a story just don’t just go on an on without knowing who your readers are. Stories are awesome but long boring stories which the readers can’t relate to aren’t. So how long your About page should be? Some people would recommend to keep it as long as it needs to be. But the problem with this is, the longer your About page is, you’re going to get a big drop-off. Keep it short and concise. Ideally, it should be between 500 to 800 words. Some people suggest that you should include some contact information on your About page. However, unless your About page also acts as your Contact page, you should create a separate Contact page. In your contact page, you can provide company information, phone numbers, email address, or online Contact Us form, mailing address, location map or anything necessary. Including images on your About page is a way to build trust. Visitors often felt cold and distant about the business or website if there’s no photo of people on the About page (stock photos do not count). So putting the face behind the name should help boost your credibility. After the visitors read your About us page, you need to send people or ask them to do something. Don’t leave it to chance, guide them with a call-to-action. As one of the most visited pages on your blog/website, your About page should have some kind of call to action (CTA). Whether you want them to subscribe to your newsletter, direct them to your popular posts, follow you on the social media (Facebook, Twitter, LinkedIn, Pinterest etc.) or learn about (not buy) your products, decide what action you want your readers to take and ask them to take that action. Ideally, you should focus on one call to action as too many options will decrease your conversion rate. Often your CTA converts better once your visitors get to know you better. Whether you want to write an about page for your blog or your small business, here’s a few great samples of the best about us pages on the Internet that you can “copy”. Use them as a template to help you come up with your own awesome About page layout and content. Even before he started talking about himself, he offers quick links to his most useful posts. He hand picked those that make good impression on a new reader and offer valuable in-depth valuable guide with conversion content. The “About You” section further down draws readers attention back in where he explains why helping others is the only way to live his life meaningfully. Finally, the call-to-action is placed at the end, to get readers on the mailing list. 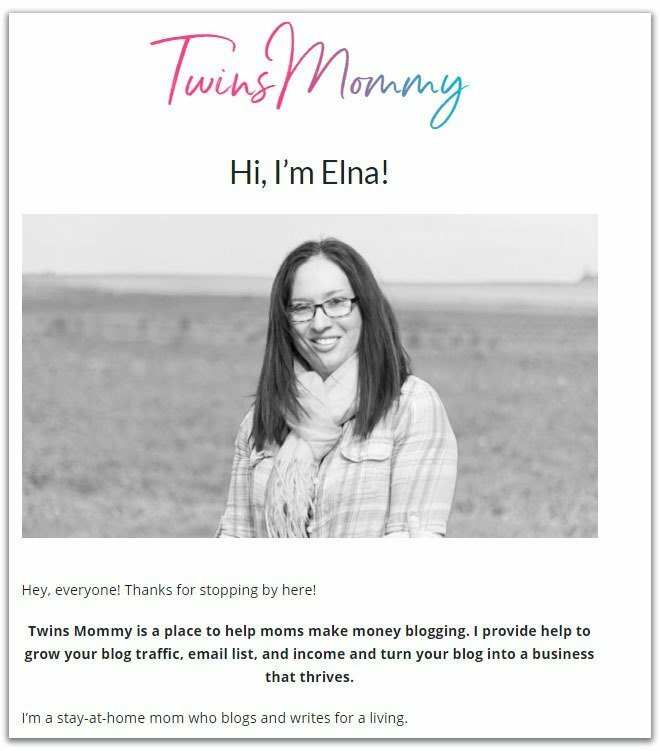 There’re many stay-at-home or work-at-home mom who are also successful bloggers like Elna from TwinsMommy.com. Elna starts by introducing herself and includes a nice picture of her. By opening up her About page with her name and picture, it gives immediate sense of trust and familiarity to help her readers know and want to follow her. Right off the bat, she tells the reader how she could help other moms make money blogging and turn their blog into a thriving business. She also mentioned she writes for a living. It’s a subtle way to let the reader know how she can help them in blogging. The rest of her story is to connect with the intended audience and gain their trust. CopyBlogger starts out by talking about others. Their About us page stresses the benefits readers can get from their blog. The page is clean, simple yet very engaging.Even when talking about their history, they explain how they came to know the importance of content marketing years before it’s called content marketing. 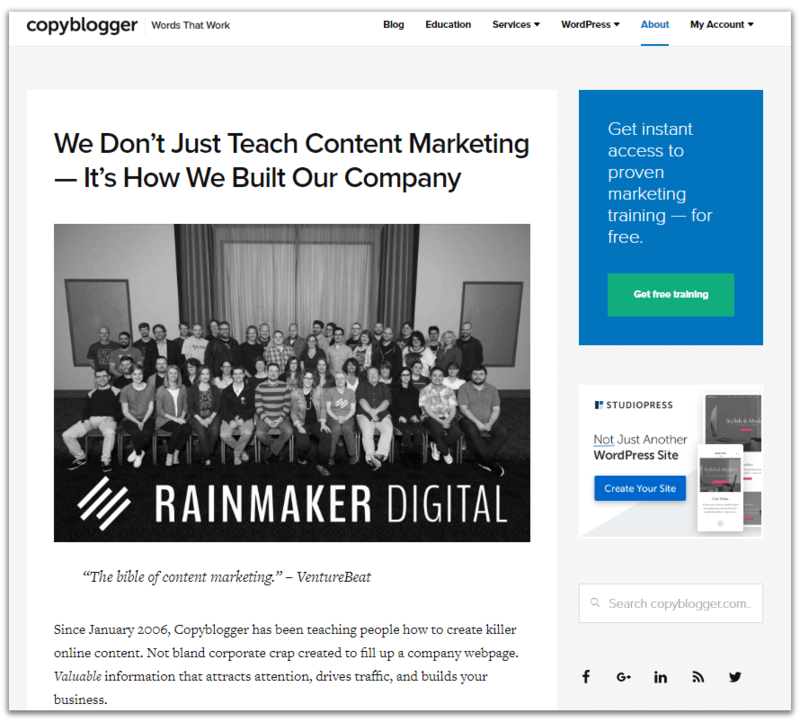 At the end of the page, they offer free to Copyblogger membership as their CTA offer. I’ve visited Problogger since its early day. 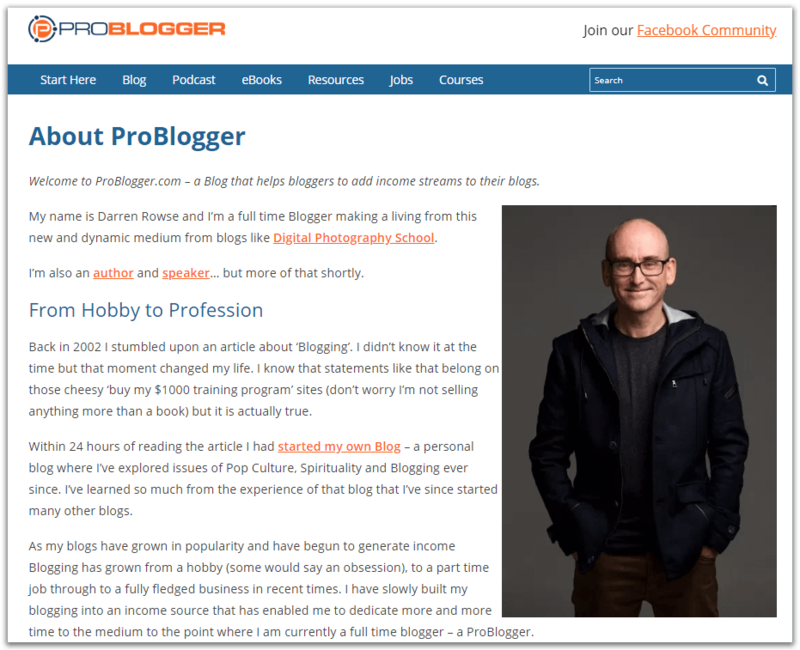 Darren managed to attract loyal followers to the Problogger brand with his dedication to providing excellent content and guidance to the bloggers community. You would think that as someone who has accomplished many things, his About page could be very long but it’s only 675 words! The trick is he includes a 49 minutes long video if you want to learn more about him and Problogger. John Chow knows how to use adjectives and emotional words to get attention. 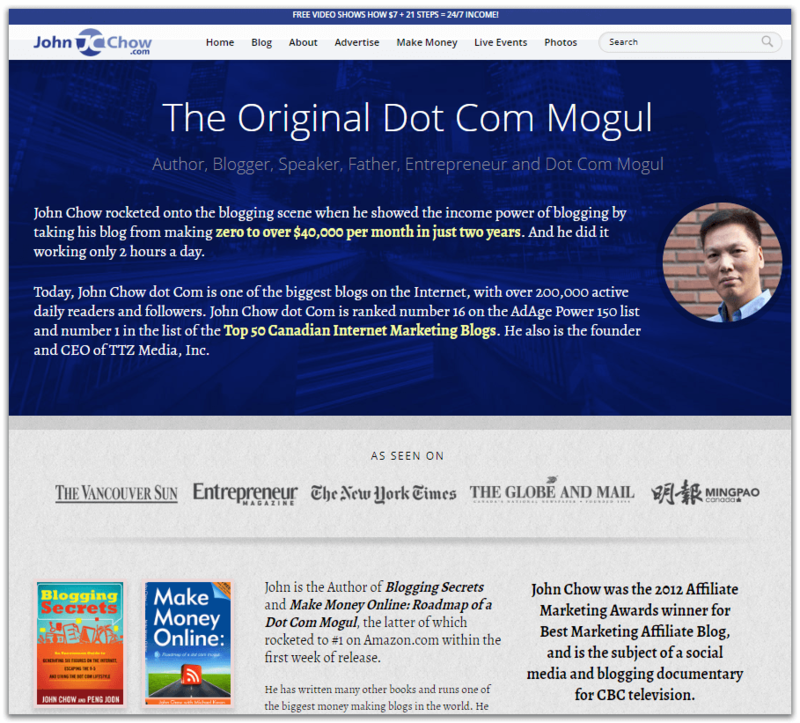 His About page is written in the third person.Instead of explaining what the readers will get from his blog, he let others do the talking via video testimonials. It’s funny because I used to pay John $400 to review Sabahan.com in his blog in July 2007 so I came to know his blog a long time ago. Twitter About us page is simple but impactful as they are using their own social media platform to showcase what they are all about. 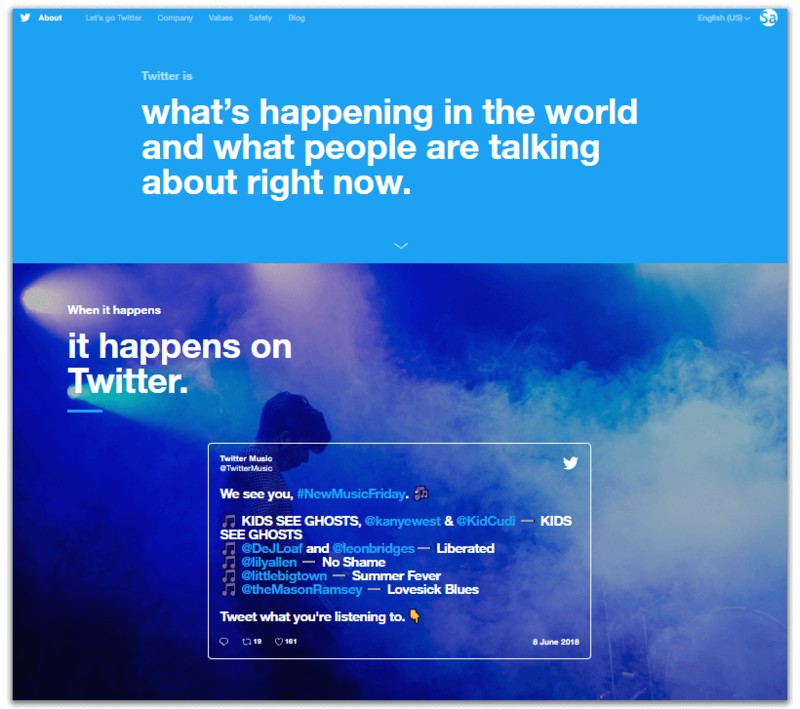 The page displays changing images of trending events as well as tweets from high-profile users. At the bottom of the page, for their call-to-action, they offer the reader to see what’s happening himself. You may have heard of Tim Ferriss from his successful 4 Hour Week book like I have. 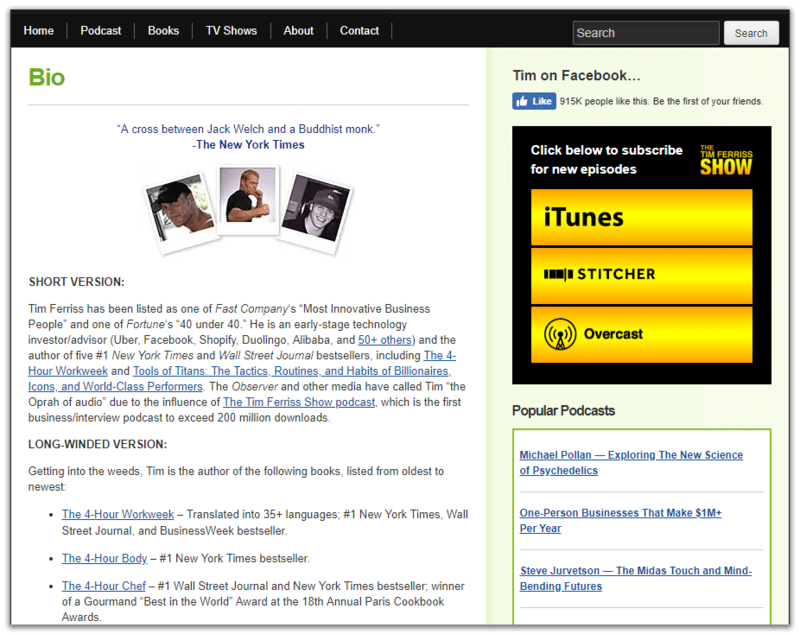 Tim Ferriss includes both a short and a long-winded version of his About page. It is also written in the third person to great effect as he was able to list all his accomplishments without sounding like his bragging.He focuses on establishing authority and credibility via social proof. When you browse his about page, you see testimonials from industry experts, popular news publications and magazines around the world. 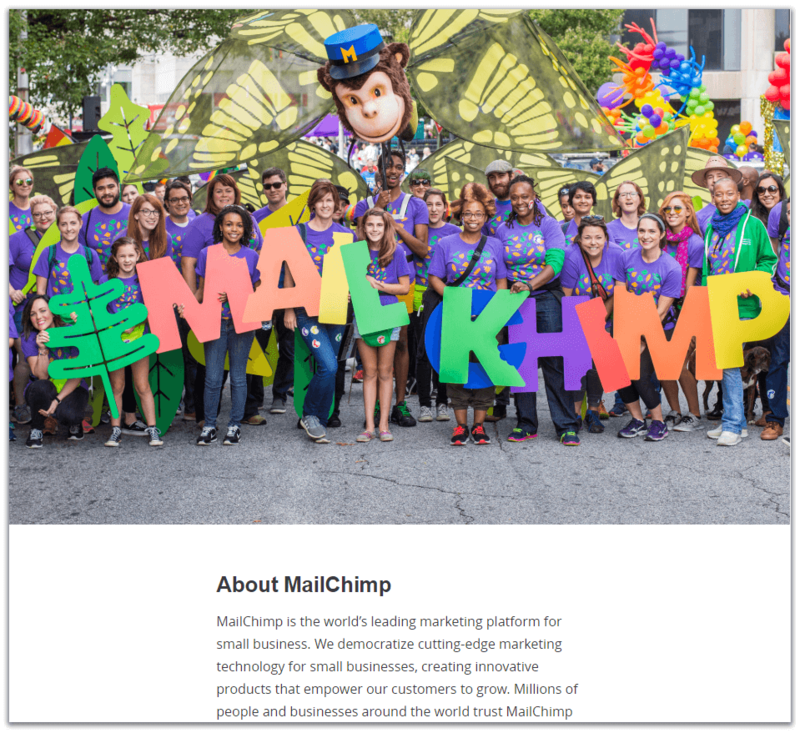 The colourful staff photo mixes the warmth with some actual business.Their About page is simple, fun and effective. The first sentence summarizes what National Geographic is all about. Their story is about their unique ways of storytelling to get you closer to the stories that matter! They’re also using video effectively. The About us page website design is simple. 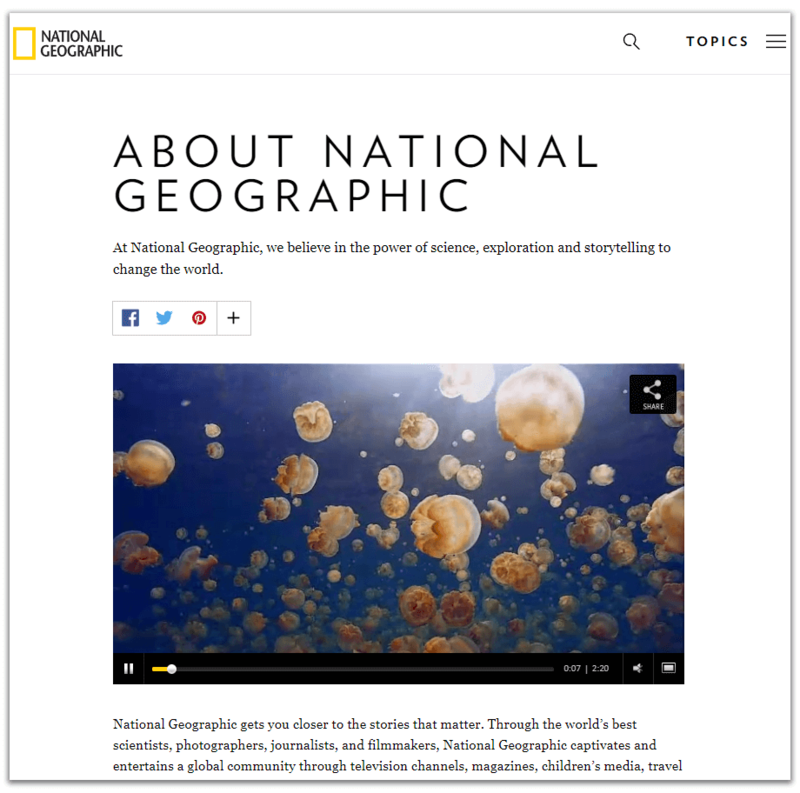 At the bottom is their CTA which directs visitors into the categories that NatGeo is known to endorse. If you are serious about blogging, having a good About us page is important. In addition to telling your visitors about the people behind the blog, you should also share your mission statement, values and what your visitors can expect to get from you. 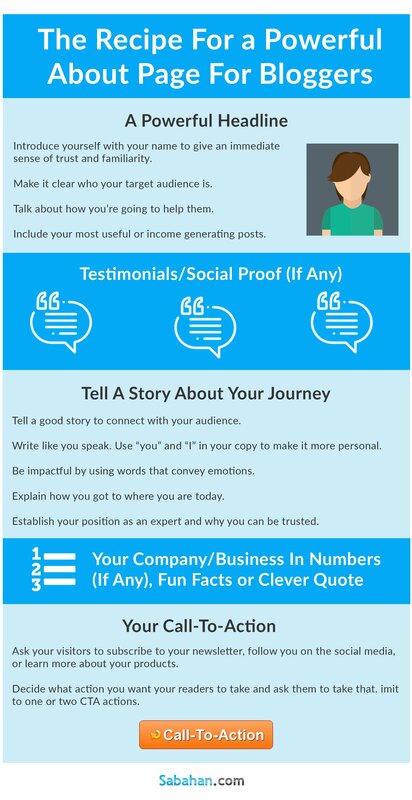 Create a story about you or your business. People like to read stories as it establishes a connection. Be creative and think about what you want to achieve. Then put these tips into practice and see how it helps you write the “perfect” About page for your blog. Please share this article if you find it helpful. I’d also love to know your thoughts in the comments below. Thanks for reading! Nice post thanks for sharing this post keep up the good work. Super post Gaman! From Elna to Ramsay you included my buddies here 😉 I took a cue from Neil Patel’s old school about page, digging down and creating a bit of a Wikipedia resource of my life. Folks want to get to know the source before they trust your advice. Thanks Ryan. Since creating this post I’ve been paying more attention to my own About page. It’s a learning experience for me and a fun one at that! Great post! I really needed help with my About Me page. Thanks Malvika! Glad to know you find the post useful. I really enjoy reading this post! you offer great advice on how to improve our blog! thank you for sharing !! Glad you find the post helpful Ana! Creating an About Page is often left to the last minute for many. Hopefully more people will realize that the About Me page is one of the most important pages for any blog!